1983 was the era of Star Wars and tv execs responded with V, a two part miniseries about benevolent aliens coming to Earth. They offer a mutually beneficial trade – their scientific and medical knowledge for supplies of common elements that their dying planet desperately needs. The Visitors, as they come to be called, look human except their voices are slightly modulated and their eyes are sensitive to light, so they wear dark sunglasses a lot. As they slowly maneuver themselves in positions of power, their charismatic promises and military uniforms take a page from the Nazis as they turn the world’s countries into police states. 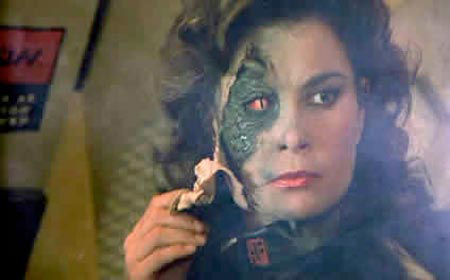 Even worse, it turns out the Visitors are reptilian wearing fake skin – they eat humans and are stealing the Earth’s water. 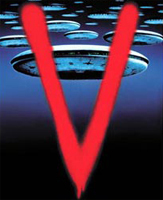 A four part miniseries, dubbed V: The Final Battle, took place a year later that ended the conflict. And a single season run of regular episodes soon followed, although they weren’t very good. Still, V had its place in science fiction history and it was fun for me to recently rewatch some of the episodes. I was excited to see that there was a reimagining of the series in the works. Of course I was concerned that it wouldn’t be very good, but it would be cool to see a modernized version of alien big brother. The first bad sign was when I found out that the 2009 episode run was supposed to start with 6 episodes but it had to be cut down to 4. On top of that, it would be near impossible to have the aliens visit, greet us as benefactors, then reveal their true nature all within an hour timeslot. So describing my mood as cautiously optimistic is being nice. The pilot episode was some of the worst writing I have ever seen. First of all, they took away the few distinctions that made the Visitors different. No dark sunglasses, no cool voice, no uniforms. People like seeing these nuances. It is what makes alien movies cool. Instead, we are treated to a pilot episode where we basically only see one alien, the leader, who came from the ship above New York. There is nothing special or different about her except that she comes off as mildly retarded because she likes to smile and stare a lot. And I’m sorry, the business power suit is not a cool look for an alien. Of course, there is a reason that the writers want the Visitors to look and sound exactly like humans, and that is because they are introducing a new plot element to the series. Many Visitors have been here for years masquerading as humans and causing strife on our planet. They are hinted as causing JFK’s assassination and 9/11. In fact, an FBI agent in the pilot is killed and revealed as one of them. Now, I could sit here and nitpick about how unrealistic it is for reptiles wearing cloned human skin to live on Earth undetected for 50 years. A single car accident would foil that plot. I could also blame the writers for taking the easy way out and always using the reveal that someone was really a Visitor whenever they are in need of a plot twist. But instead, I am shocked that the writers didn’t realize that this plot crutch completely negates another major story element- that the Visitors recruit humans into service as helpers and informers. They convince a news reporter to, “not ask questions that would paint them in a negative light.” If the aliens have been here for 50 years and can pass for human, then why do they need a human news reporter to be their spokesperson? If they wanted to control the media, they didn’t do a very good job of seeding the planet. Some may argue that story inconsistencies are unimportant as long as the show is entertaining. I am not going to get into the awful dialog. Or the fact that the aliens refer to themselves as ‘Visitors’. Or that the new slang is the ‘Vees’. It was a horrible experience watching this thing. But I watched it to the end, hoping that even with as big of a hole as the writers dug themselves into, that something decent could climb out. One of the final scenes shows a ragtag band of humans forming a resistance at a secret meeting. They are attacked by Visitors, and even though the good guys have no weapons, for some reason the aliens disappear after everybody but the main characters are dead. It’s as if the writers just wanted to start the next scene without bothering to finish the previous one. FBI lady kills her partner and finds out he is a reptile alien, and she walks away with another human as they wonder how they are going to build a resistance against the Visitors who are winning everyone over with charm. Well, let’s see, how about showing everyone the dead reptile body? Better yet – there is a Visitor sympathizer on Earth who wants to help the humans. Why not just walk to the nearest news station or post a video on youtube? The secret of their reptile nature would be exposed immediately. If, of course, all the characters on the show were not complete idiots. And how am I supposed to like these characters when they are all morons? And how am I suppose to like the show if I don’t like the characters? The 1983 show wasn’t without its faults. It was pretty cheesy but the original concept stayed focused on the theme of charismatic leaders turning the nation into a police state. The new show is just all over the place, and so are the plotholes.